Wright Medical Group N.V., a global leader in the orthopaedic extremities market, announced that it builds on its robust foot and ankle portfolio with the availability of the ORTHOLOC 3Di Small Bone Plating System, providing clinicians with a low profile, comprehensive plating solution designed to address metatarsal fractures. The ORTHOLOC 3Di Small Bone Plating System is intended for use in the stabilization of fresh fractures, revision procedures, joint fusions, and reconstruction of small bones of the hands, feet, wrists, ankles, fingers, and toes. The system can be used in both adult and pediatric patients. For more information about ORTHOLOC 3Di Small Bone Plating System, please visit http://italiano.wright.com/footandankleproducts/ortholoc-3di-small-bone-plating-system. More information on Wright Medical’s products can be found at italiano.wright.com. Wright Medical Group N.V., the global leader in the orthopaedic extremities market, announced that it builds on its robust foot and ankle portfolio with the availability of GRAVITY SYNCHFIX Syndesmosis Fixation Device, allowing clinicians to provide secure, dynamic fixation across the ankle syndesmosis. GRAVITY SYNCHFIX offers low-profile syndesmosis fixation device that allows for flexible fixation and preserves bone and soft tissue, while facilitating ligament healing. Syndesmosis fixation is necessary when patients suffer from ankle trauma, including fractures, which often cause damage to the fibular and tibular syndesmosis ligaments. In order for the ligaments to heal properly, the fibula and tibia bones must be stabilized. It is estimated that over 145.000 ankle fractures occur each year in the United States, a number that is growing by 10% annually due to an aging population (SmartTrak 2017). The GRAVITY SYNCHFIX Syndesmosis Fixation Device is intended to provide fixation during the healing process following trauma to the ankle syndesmosis (Syndesmosis disruption) and as an adjunct in connection with trauma hardware for ankle fractures such as Weber B and C.
The GRAVITY SYNCHFIX Syndesmosis Fixation Device may be used for definitive treatment as the sole fixation device, or used in conjunction with other Wright Medical lower extremity products, including, but not limited to the ORTHOLOC 3Di Ankle Fracture LP System. For more information about SYNCHFIX, visit: http://italiano.wright.com/footandankleproducts/gravity-synchfix-syndesmosis-fixation-device. 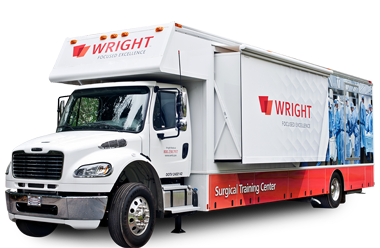 Wright Medical Group N.V., a global leader in the orthopaedic extremities market, today announced the first patient implanted in the U.S.-based INFINITY™ Total Ankle System Follow-Up Study at the Campbell Clinic in Memphis, Tennessee. The primary objective of the multi-center, non-randomized, prospective study of 200 patients is to evaluate 10-year implant survivorship in patients with ankle joints damaged by severe rheumatoid arthritis, post-traumatic arthritis, or degenerative arthritis who received the INFINITY™ Total Ankle System for primary ankle arthroplasty. The secondary objective is to characterize the improvements after implantation with the INFINITY™ Total Ankle System over a 10 year period using patient reported outcome measures related to quality of life, pain and functional scores, as well as x-ray assessments. In 2016, Wright Medical launched the post-market INFINITY™ Total Ankle study in the UK. The multi-center, non-randomized, prospective study of 500 total ankle replacement patients will evaluate 10 year implant survivorship and outcomes throughout the lifecycle of the INFINITY™ Total Ankle System. Wright has enrolled more than 100 patients across multiple sites in the UK, including England and Scotland, as of Q3 2017. As in the U.S.-based study, the secondary objective of the UK study is to characterize improvements after implantation with the INFINITY™ Total Ankle System over a 10-year period. Of the roughly 50.000 end-stage ankle arthritis patients in the US each year, an estimated 8.000 will receive a total ankle replacement in 2017 and the rest will receive an ankle fusion or conservative care. With an ankle fusion, patients undergo a surgical operation where screws or plates are used to join or “fuse” the bones of the tibia and the talus in order to create a solid and immobile ankle joint with the goal to alleviate pain. Patients who receive a total ankle replacement undergo a surgical operation where ankle replacement implants are used to resurface the ends of the tibia and talus that have been damaged from ankle arthritis, with the intent to help alleviate pain and maintain mobility in the ankle joint. The INFINITY™ Total Ankle System combines a low-profile implant design and seamless integration with PROPHECY™ Pre-Operative Navigation Alignment Guides. It also features a distinctive talar resurfacing option for preservation of talar bone and a tibia design that is compatible with the Company’s existing INBONE™ II System. The INFINITY™ Total Ankle System is intended to give a patient limited mobility by reducing pain, restoring alignment and replacing the flexion and extension movement in the ankle joint. I risultati e i livelli di attività variano da persona a persona e dipendono da numerosi fattori, tra cui l'età, il peso e il livello di attività precedente. A ciascun intervento sono associati rischi e tempi di recupero diversi e non tutti i pazienti possono essere sottoposti a interventi chirurgici simili. More information on Wright Medical’s products can be found at italiano.wright.com. 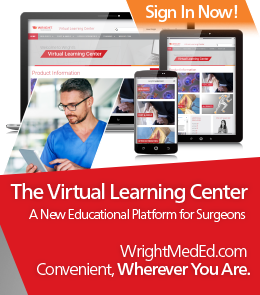 Wright Medical Group N.V., a global leader in the orthopaedic extremities market, announced that it builds on its line of limb salvage offerings with the availability of SALVATION Quick Struts, now affording clinicians the ability to make dynamic, acute corrections real time. SALVATION offers the market’s first and only comprehensive solution for Charcot arthropathy and advanced midfoot reconstruction, helping patients avoid full and partial foot amputations. Charcot Foot is a serious condition that results from neuropathy, usually the result of diabetes. This condition results in the breakdown of the foot inflammation and damage affecting joints, bones, and soft tissues of the foot. Studies have suggested that as many as 13% of all diabetic patients and 29% of neuropathic patients may be affected with this condition. In the U.S., there are an estimated 51.000 new Charcot patients per year. Variable sizes – Short, medium and long sizes, each overlapping each other for maximum modularity. Each kit comes with four of each of the three sizes. Double Ball Joint Locking Capabilities – Locking ball joints provide a large degree of angular correction, giving surgeons multiple fixation options. Macro/Micro Compression Distraction – The telescoping strut body provides quick macro compression/distraction. Adjustment knobs allow surgeons to dial in micro-adjustments both intra- and post-operatively. The SALVATION™ External Fixation System is designed to address fractures, nonunions, and complex foot and ankle deformities including Charcot neuroarthropathy. The system relies on proven techniques utilizing tensioned thin wires, half-pins and rings. The SALVATION External Fixation System incorporates many new features to assist with proper frame positioning and increase frame application efficiency. Il modello ad anello scanalato consente il fissaggio rapido e semplice dei componenti della struttura, minimizzando al contempo l’esigenza di assemblare insieme componenti filettati di dimensioni ridotte. The system includes components to assist in the positioning of the foot and lower leg within the frame and maintaining appropriate position throughout the surgery. Inoltre, il guidafilo consente di collocare il filo con precisione sull’anello per minimizzare l’esigenza di ulteriori componenti di collegamento e di ridurre ulteriori fasi chirurgiche. The SALVATION External Fixation System may be used for definitive treatment as the sole fixation device, or used in conjunction with the SALVATION Beams and Bolts or the SALVATION 3Di Midfoot Plating System. For more information about SALVATION, visit: http://italiano.wright.com/healthcare-professionals/salvation/salvation-external-fixation-system. Questo sito è destinato ai residenti negli Stati Uniti. ™ e ® indicano marchi di fabbrica e marchi registrati di Wright Medical Group N.V. o delle sue affiliate. Questo sito è rivolto agli operatori sanitari. Conferma di essere un professionista del settore sanitario. Sei un professionista medico residente in Francia? wright.com finora produce contenuti in olandese, francese, tedesco, italiano, giapponese e spagnolo.